They found tickets online and paid $300 for them and they never received them. INDIANAPOLIS – A family thought they’d attend the Colts game this past Sunday – but instead they were at home dealing with the police. Shaun and Tiffany Martinez say they will never buy tickets on Craigslist again. “I mean, this is why I usually go through Ticketmaster,” Shaun said. They were looking for a deal Sunday – hoping to take their kids to the Colts game that resulted in a win over the Cowboys, - when they found an ad on Craigslist. “I just assumed that it was somebody who can't go to the game and just were trying to get rid of them,” Tiffany said. The Martinez family requested a photo of the tickets from the seller. The seller sent them a screenshot of tickets from stub hub. Once they decided it was legitimate, they sent the $300 that was requested to his email. After which, he accepted and never responded to their messages again. “We tried calling, he didn't answer. We sent text messages letting him know that I was calling the police,” Tiffany said. The family is still working with their bank to see if they will get their money back. 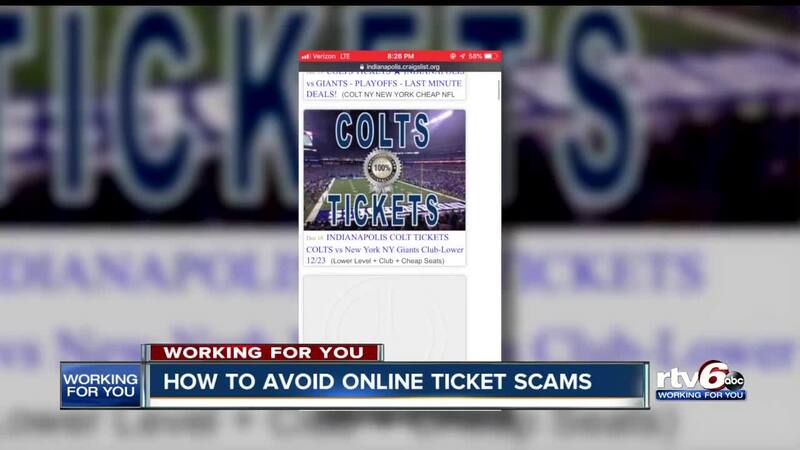 The Better Business bureau says when shopping for tickets online – stay off Craigslist altogether. Beware of ads with ridiculously low prices. And if the deal appears too good to be true, it probably is. There has been no word from investigators on whether they have any leads in the case.